Confirmed drop off Eredar Supplicant, located west of Illidari Stand. Took around 60 kills. This item starts a quest - The Grimoire of the First Necrolyte. This begins the process to unlocking the Affliction Warlock hidden Artifact Weapon Skin (Fate's End). Is there a level or quest requirement for this to drop? Spent a full level doing nothing but farming the Supplicants and not a single drop. Does anyone know if you have to be in Affliction spec to have it drop? similiar to the Corrupted Ashbringer Skin for Paladin (Source: https://m.reddit.com/r/wow/comments/52t3ik/corrupted_ashbringer_skin_found/?utm_source=mweb_redirect&compact=true) you need a certain amount of Artifact Research Notes before. How much is yet to be discovered. That explain why during the end of Beta people could get the item dropped. No use in farming this item now. Confirmed drop from Eredar Supplicant. Artifact reasearch lvl 5 and it took around 30 kills. Can confirm that it drops from Shadowsworn Defilers in Highmountain Burial Grounds. It dropped for me today while I was trying to farm for the Damaged Eredar Head for the Demonology hidden appearance. I was also Demonology spec, so you don't need to be Affliction to farm this. there are a bunch in and around the building Soul Engine: Apocalypse, I was tired of fighting levelers and other locks for the supplicants, which I'm sure will get worse in time. Took me only around 20mins to get it to drop. Lots of demons around but sow the seeds is all I was really using anyway. For about 30 minutes I farmed the Eredar Supplicant in Azsuna but had no luck. Second or third kill on an Eredar Soulmage (I pulled and looted two at the same time) granted me the Grimoire. RNG is RNG, but since the Soulmages are tougher (approximately 600k more health than the Supplicants) I wouldn't be surprised if they have a slightly higher drop rate. I got it looking for demo artifact head. Confirmed drop of the group of Eredar Souleaters in the middle of upper Faranaar. Received this as a drop from Eredar Soulmage near the Soul Engine in Azsuna. I got this drop about 3 kills after I got the drop for the Demonology hidden appearance, the Damaged Eredar Head. I am artifact level 6, do not have any rep to exalted and only have 3 at revered. I have farmed both of these continuously for 1k plus kills to no avail. The catalyst seemed to have been when i reached rank 20 in my highest weapon right before the drops. This may have something to do with how much artifact power you have earned altogether as well. Hope this helps. Probably completely anecdotal but I farmed this for 3 hours as soon as I hit AK-5 with no luck. I hit Exalted with Nightfallen, AK-6, 20th Artifact Point in the Affliction weapon, cleared Emerald Nightmare on Normal, and finished Pathfinder pt 1 a few days later. The Tome of the First Necrolyte dropped on the first pack of Supplicants in Azsuna after that. If I have any additional information, I will update as I come across it. -It would appear the 'Wanted' quests have a low chance, whereas the 'Danger' quests are higher - seemingly guaranteed. Got my first Skull of the Executed; dropped from 'Danger: Durguth" in Highmountain. He was level 112 and elite. I just had this drop in Faronaar from the Eredar supplicant there. AK7. Destro spec, destro as chosen spec. Dropped for me from Eredar Soulmages in Azsuna, while I was farming for the demo hidden artifact in demo spec. Confirmed drop from Eredar Soulmage today, Argent Dawn. Fast respawn of mobs but a lot of people during world quest. Video showing what to do after this book, along with the skin reward. Got this while farming for the Demonology artifact Eredar heads, killed a Eredar Shadowguard for it. I do have my loot spec set to Demonology and still got this item, so your loot spec seems to be irrelevant. Got mine from a Navigator while farming for the Demo alt/art. 27.76, 50.61, in ship. Dropped off of Shadowsworn Defilers at the Highmountain Burial Ground for me when farming my Demon hidden artifact appearance. Confirmed the drop from an Eredar Supplicant in Azsuna. It took several hours of farming. I recommend to establish a circular route that interconnects the purple runes at which you typically find 2 such mobs. Ironically, I got tired and numb from hours of farming, then logged out to do something else. After 10 minutes I logged back in, and the first kill did it! I was in affliction spec when it dropped. 3 factions revered, 3 honored, 21 artifact points, AK 7. Never been to any raid in Legion. Class campaign is completed. I do not have the Broken Isles Pathfinder, Part One achievement yet. I had given up farming Supplicants for it. While doing the world quest Unwelcome Visitors Blargemal dropped it for me. I just had this drop from Arkethrax while doing the "Unwelcome Visitors" world quest. Don't bother with the Eredar Supplicants. There's a small Legion ship with six Eredar Navigator spawns packed into one room. Fly to Illidari Perch (NOT Illidari Stand) in Azsuna. From here, follow the path west as it leads up a gently sloping hill. On your left will be a green portal (26.8 , 48.9). Find another warlock who also wants to farm for this, or the Demo appearance! The spawn rate DOUBLES with a second person in the room. Do this on a day when Inquisitor Tivos is the world quest. Even if hes not, goto the same spot, it just will not be as fast. It is still the best option for farming regardless. You can kill him or not, it doesn't matter. Just keep killing the Eredar Navigator that spawn at his location. During the world quest they respawn very fast! Took me just over 300 kills. I Tried farming the Eredar Supplicant for a while before doing this and it was torture. I have killed over 5000 Eredar and still have not got this to drop. Blizzard hates me. I used ak books on my alt so she's already 26 ak now, I've spent hours killing the mobs required....supplicants and navigators....still no drop. I'm not sure if AK5 is the only requirement for this to drop. I started farming Eredars with AK25 but not too many Class Hall Campaign quests finished. I spent 5 hours on those without luck. After finishing mentioned quests, it dropped after ~10 kills. I tried loads of different tips from Wowhead to get this quest-item. So I'll share what I found out. When it comes to droprate, the Eredar Navigator has a 0.15% droprate for this item and the other 10 mobs that according to Wohead can drop it is between 0 and 0.06%. So the navigators are the best bet. Having another player in the group at the same place did not increase the spawn rate for the mobs. But killing every mob there felt like it increased the rate of spawns. I had AK30 when I farmed it, dinged 110 the day before and had done no warlock campaign quests. So it seems AK5 still is the only req. You dont have to take the portal to the Soulrender to get inside if you have flying, just fly straight up and in. When you get the item a quest pops up straight away, so you will know when it drops and don't have to look for it in your bags. So, the best thing is to get your farming shoes on, some good music and farm away. With 0.15% droprate it can drop from the first mob or even mob number 5000. RNG ftw. I got it after about an hour of farming. Don't know how many kills, but that will be different for every player. Got tired of farming on the two mobs everybody is farming and started killing all eredars on zone. The information that it only drops from specific mobs in Azsuna is no longer correct. I got it from an Eredar mob during a Legion Invasion in Highmountain. Just got a drop from Argus, so confirming this drops from demons there too. Will now drop on Argus as of patch 7.3. Got mine within a few first kills, including the Eredar head drops for the Demo appearance. This dropped for me on Argus, which is weird because I was in destruction spec. I'm not sure how this quest works but I think there might be a bug. It seems you do not have to be in a argus zone to make it drop , right now im doing an legion invasion and got this quest dropped for me . This comment might not be seen by many, but it now also drops from ALL Eredar mobs in Argus. For me, it dropped from a random Felsworn Excavator. I had tried to farm it in Faranaar for many hours and nothing, so good thing we can now get it through regular gameplay in Argus without trying too hard to farm it. Got this while questing/killing all the Eredar in the Annihilan Pits in Argus. This dropped for me off of Rayesh at 56.8, 56.4. He's the objective of the Hellish Scavengers world quest. I was going to farm this in Aszuna, since that's where the hidden artifact guide says it drops. But I was tired, and decided I didn't feel like doing something as monotonous as grinding mobs because I might fall asleep. Figured I'd get started on the Broken Shore questline to work toward my class mount, since I'd just hit 110, so I went out doing WQs to find a Mysterious Runebound Scroll and gather some nethershards for the later steps. 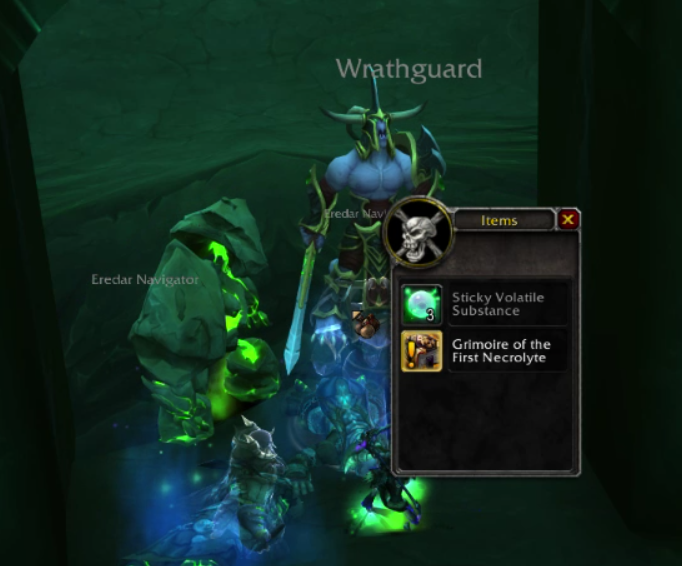 I know I probably just got lucky, but this guy was the first Eredar I killed after looking up how to get my hidden appearance. I made a custom tracker in the Rarity addon, As at 6/Jan/2017, there are 83 NPCs on Wowhead that have confirmed drops of the Grimoire which starts the quest chain, I've added them all to this tracker. I've set the estimated number of kills at 1000, based on what appears to be about a 0.1% drop chance across all mobs (considering the numbers presented will include non-Warlocks and Warlocks who have already acquired the skin). It unfortunately cannot do retroactive tracking to see how many mobs you've killed before importing this. Here's what it looks like in game. Here is the export string if you'd like it to import it yourself. Gloth just dropped this for me from the Gloth legion invasion in Val'sharah. Hopefully people will see this, I found a pretty good spot, I got the Grimoire in about 30 minutes farming this spot. The location is Darkfall Ridge in Krokuun; if you teleport to Krokul Hovel, go south to that last piece of road, near the tip of Vindicaar. There you'll see Khadgar, Vereesa, Aethas and Silgryn fighting an Eredar Conqueror and about 5 or 6 Felseige Champions....the spawn time is very fast and there are always about 5 Champions up consistently, you can get a lot of kills very fast. Also, I got tired of tagging everything with Affliction so I switched to Destruction and it dropped. Grimoire of the First Necrolyte (because I'm curious), I wanted to know if I needed the book with me to get the Skull of the Executed drops. It also disappeared. I also recommend the aforementioned Eredar Navigators. I got the Grimoire on the first respawn and The Visage of the First Wakener off the same mob! Dropped from Zor'thaduun (or one of his minions, as I looted a pile of bodies around him) while doing the Legion Invasion in Azsuna. "A tome detailing the collected spells of Sataiel, the first necrolyte."